As automation looms and more and more jobs are being shaped to accommodate the tech-saturated “knowledge economy,” 63% of full- and part-time workers say they have taken steps in the past 12 months to upgrade their skills and knowledge. That is one of several key findings from a Pew Research Center survey conducted last fall to understand people’s motives for learning, both in professional and personal contexts. The Center then held a series of related focus groups in December, drawing insights from those in the Baltimore, Atlanta and St. Louis metro regions. Here are some of the key themes that came out of those conversations about learning, work and a changing economy. [In 2008] I saw everything going on around me with co-workers, neighbors, friends and asked myself, “Who’s coming after me and my job? How long are my skills going to last?” …. I did some research that was pretty comforting, but I try to spend a little time every couple of months now reassessing my status. My friends and I just assume that what we do now will be obsolete in the next decade. That’s our reality. You always have to keep learning and improving. I don’t know whether to laugh or cry when there are ads for all the things computers can do that used to require people [to perform]. You don’t want to stagnate in your learning and your position. My thinking is you have to have a hunger to learn, or else the people who do have that hunger are going to make you seem like you’re out of it – [you’re] besides the point. I want to be alert and keep my mind working and going. I don’t want to be somewhere stuck. I keep trying to learn more by challenging myself, thinking outside the box. Be creative, inspirational, that kind of thing. I would hate myself if I stopped trying to get better at what I do. Everything in life is getting more competitive and it starts with the job. There are people trying to get hired and get promoted. There are people trying to show how much they have learned and how much they have done – real resume builders. There are people who will work for less in other countries. [Expletive], I even compete with myself. I just started body building and I want to get better – and also beat the people working out in the gym around me. It’s so satisfying to master something and make yourself valuable to others. You know, [when it starts as] something that you never knew that you could do and then you learn you can do it, it’s like, ahhhh. I got it. There is no better feeling. It makes me feel really good that I took the time and didn’t do it halfway. I gave it 100%. And they did not expect these results at all, so it really makes me feel important in that organization. I have to make so many decisions for my family and my work. I have to stay on top of research to make educated decisions for myself and the people in my life. My colleagues depend on me and my children depend on me. My personal drive for [mastering work-related knowledge] is to tell them or show that they are wrong about me. It’s like a ballplayer when you say “you can’t do this” or “you’re not prepared to succeed.” … I just say to myself I’m going to show everybody my own personal way that I can do this. But there are naysayers everywhere. … You can’t miss them. And it is so great to show them how wrong they are. What motivates me? To prove a point. So that’s probably on the more negative side [laughs] to show that I can do it and kinda, “[Road rage gesture] to you. I did it.” That’s pretty raw, but to prove a point I will stubbornly study and study and study and figure out how to do it. Learning brings its own rewards. There is undeniable stress for many as they adjust to the new economy. 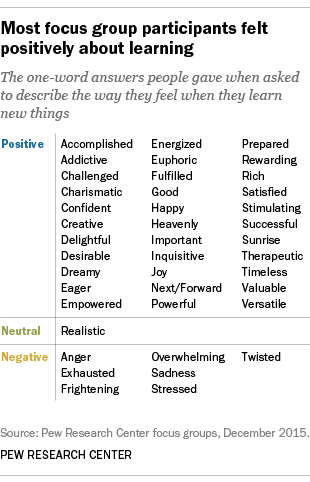 Yet, when asked to provide a single word to describe their feeling about learning, most of the focus group participants chose a positive rather than negative word. And they much more often spoke of the pleasure of learning than the pain of it. Their responses are listed in the adjacent table.